At just 23 years of age, Boyan Slat, has scooped the European Entrepreneur of the Year award at a Brussels awards ceremony held as part of the European Business Summit. "The ocean is a horrible, horrible place for anything manmade. The engineering has been a challenge." The Dutch inventor and entrepreneur has one breath-takingly ambitious goal: to rid the oceans of plastic. The first challenge he's set his startup, The Ocean Cleanup, is to take on the Great Pacific Garbage Patch, the largest ocean plastic dump in the world. Slat hopes that his innovative, yet disarmingly simple, system will have cleansed oceans of 90% of their plastic by 2040. Euronews' Jeremy Wilks spoke to him to find out more about the startup that is bringing hope of cleaner oceans around the world. The system devised by The Ocean Cleanup involves 600-metre-long, U-shaped floating barriers which scoop up the plastic waste from the sea, and concentrate it in one place, so that it can be collected by "garbage truck" boats which take it to shore. These barriers are passive, working with - rather than against - powerful ocean currents. Boyan Slat explains that water at the surface, which is where most of the plastic is found, moves more quickly than the water of the deep. The barriers each have a line down to an anchor that travels through the slower-moving, deep water. This slows down the barrier, enabling it to gather up the faster-moving plastic. Boyan Slat had a moment of inspiration when he went scuba-diving in Greece at the age of 16. Noticing that there were more plastic bags than fish, he decided to do something about the problem. His first idea came to him as part of a High School project, and later he quit his studies to start his own company. Even raising the money for such a worthy cause wasn't easy. Boyan Slat says that, at the start, he wrote to about 300 companies asking for sponsorship and only got a single response - telling him that it was a "terrible idea". Then the idea went viral and donations started to come in. This was the start of a five-year process, involving hundreds of tests models and millions of euros in donations. The company's first prototype barrier lasted just three weeks in the corrosive environment of the North Sea. The engineers had their work cut out to develop a version that would last. But they persevered and the first barrier will be ready to launch in July or August this year. What will happen to the plastic? Sending the plastic to landfill would not solve anything. Boyan Slat's scheme envisages it being re-processed and made into products that his company could sell to make enough money to become self-sustaining. What will those products be? The details won't be announced for another year, but Slat is clear that consumers won't have to choose between high quality products and doing good: "we won't compromise" he says. Boyan Slat explains that around 800 species are affected by plastic ocean waste, 200 of which are categorised as endangered. Some species mistake plastic for food and eat it: it fills them up so that they no longer feel hungry, but is not nutritious so they starve. Others suffer damage to internal organs from plastics they have swallowed. Still more become entangled and die. 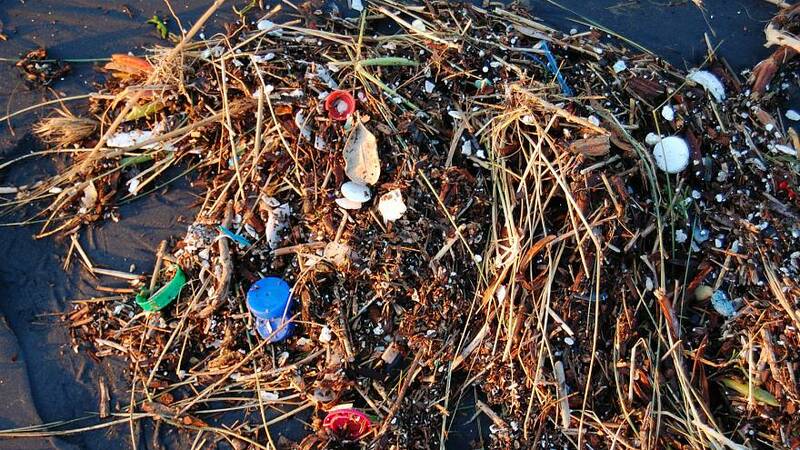 Ocean plastics are a risk to human health too. Once animals eat the plastic, harmful chemicals become part of our food chain and cause disease. Finally, Slat points out the economic impact of the damage done by plastic waste, estimated at 11 billion euros by the UN. Time is ticking, too. Plastic objects get broken into smaller fragments over time. The smaller the plastic, the more readily it gets absorbed into the food chain, and the more difficult it is to gather up. "92% of the plastics are still large," Boyan Slat says, "so it's urgent that we clean up [before they become too small]". With characteristic humility, in accepting the award, Boyan Slat suggested that it was "maybe rather prematurely given since we haven't cleaned the ocean yet". But the startling progress already made by his company suggests that it won't be too long before he has achieved his goal.